Chosen Men is an eye opening documentary that explores the changing identities of the modern day soldier and the challenges faced upon returning to civilian life. Some Fresh Ideas Overwhelmed by an Uneven Script! This Australian independent supernatural - themed film is by no means a 21st century Exorcist, but arguably deserves a little more positive attention than it's currently receiving. The cinematography throughout is of a very high standard and unlike many other contemporary films, we can clearly see what's going on. It sounds basic doesn't it. We go to see movies. The trouble is these days we frequently need to peer through the murk, masquerading as lighting to watch the action. The locations and setting for a ghost film are also unusual to say the least. We don't usually associate this genre with attractive, sub-tropical regional Australian towns. The special and sound effects are more than adequately used in a movie obviously made on a limited budget. The acting displayed by a cast of relative unknowns (to this writer anyway) is never less than competent. The main problem with the film lies within the script and the manner in which the story is constructed. None of the major characters receive any detailed backstories. How did the married couple end up in this town? Why does this town happen to have a pair of exorcists inhabiting the local church? Why should Dee, Father Joe's niece and a lay person have this background knowledge of demons and exorcisms and why should she have apparently ended up in court (offscreen) for carrying out some sort of exorcism? (BTW, the Dee character is obviously channelling the Deborah Furniss heroine from another Australian film from the 80's called Shame.) None of these issues are touched on, so we end up not caring a huge amount about the characters. The film also unashamedly and unfortunately makes use of some very common generic tropes. 1 A solitary character being haunted, who for a fair percentage of the film is labelled as "mentally unstable". 2 A resident demon who seems cut from the same cloth, as the well-known Freddie Kruger 3 A pregnant woman, whose child is sought by the forces of evil. Ho- hum! I think you get the picture. 4 Final scenes which we have all seen before in any number of possession type films and which leave the door open for a possible sequel. The climax when it arrives appears pretty rushed and abbreviated, as if the directors suddenly realised they had to wrap this movie up quickly to adhere to a 90 minute running time. It feels forced and imposed on us, rather than naturally occurring within the existing narrative. 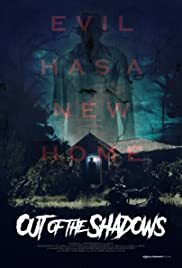 Out of the Shadows ultimately doesn't succeed, but there is some promise shown by co-directors McLachlan and Patterson, that any future collaborations may hold some interest.